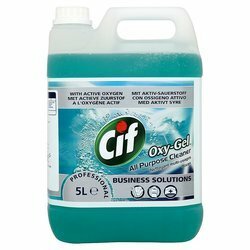 Our product range includes a wide range of cif oxy gel. For all floor coverings that can be coated. Extremely suitable for heavily used floors e.g. in schools, nursery schools, railway stations etc.. Suitable for use in hospitals, care homes and other areas where disinfectants are used. Excellent adhesion even to floors that are only superficially dry e.g. linoleum. Particularly suitable for linoleum, PVC, rubber, artificial stones. For fast and effective sealing in only 2 coats. Extremely durable thanks to a special selection of polymers and bonding agents. Excellent coverage and maximum shine after only two coats. Simple handling thanks to very good, homogeneous fLowability. Very good resistance to most hand and surface disinfectants containing alcohol. The Fast-Clean surface prevents dirt sticking, saving costs by making routine cleaning faster and easier. Suitable for refurbishing care film with S 711 Corridors Dryex and S 770 Corridors Spray. Free of metallic salts and thus Less of an environmental hazard. Can be removed easily using S 708 Corridors Power Stripper.